Storm chasers are people that knock door-to-door in storm-affected areas and offer immediate restoration services. Beware of this type of service because many are predators who take advantage of vulnerable homeowners. 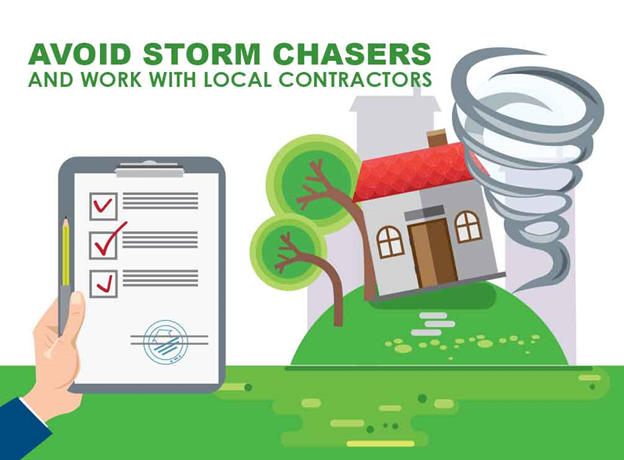 You may find it convenient to work with a storm chaser to get your home restored ASAP, but the benefits aren’t as appealing as they may seem. The potential to be scammed in creative ways, like selling you substandard materials or asking for too much money upfront is high. A good rule of thumb in tackling any roofing project is to hire local. Many storm chasers are fly-by-night companies, operating away from their home city. The advantage of working with a local contractor is the assurance of warranties. After all, it is hard to ask a roofer to fix any defects if they’re located in another state. A reputable provider of storm damage restoration services can readily provide a local address, not a P.O. Box. Furthermore, ask for local projects they’ve done in the past six months. If they cannot provide any, that is a red flag. Hiring someone uninsured is a huge mistake. If a worker gets hurt during the project, you might be liable. On the other hand, an insured roofing contractor protects you against litigation in the event of workplace accidents. Always ask for proof of insurance and then verify its validity by calling the insurance company. The best way to avoid unreliable storm chasers is not to act impulsively. Even if you want to fix any hail or storm damage as quick as possible, you should still do your due diligence. Roof problems are always stressful, but don’t let emotions lead you to impulsive decisions. Call a professional to restore your storm-damaged roof instead of entrusting your project to a stranger who randomly knocks on your door. At Affordable Roofing Systems, we’re fully licensed and insured. We specialize in providing emergency roof repairs and restoring storm-damaged roofing systems. We are certified by leading brands, including GAF, Tamko, Drexel, and Gerard, and have an A+ rating with the Better Business Bureau. For your emergency roofing needs in the Tampa and St. Petersburg area, look no further than Affordable Roofing Systems. Call us at (813) 400-2515 right now to talk about your situation and get a free estimate.